Green upholstery cleaning that is safe for employees & customers alike. Like us on Facebook to receive a special offer! 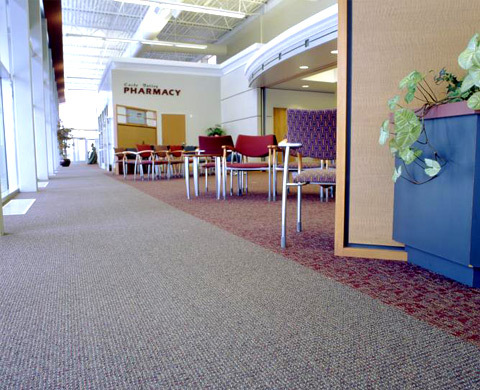 Carpet is now the number one floor covering in most commercial settings. The advent of cubicles and workstations means that fabric can cover many businesses from floor to ceiling. It’s a big investment that needs to be protected. Chem-Dry’s Hot Carbonating Extraction cleaning method uses the natural cleaning power of carbonation to lift dirt and grime to the surface of the carpet where it can be easily extracted. Commercial carpets cleaned by Ohana Chem-Dry promote a healthier working and business environment for your customers and employees. So how is it that Chem-Dry came to be leaders in industrial carpet cleaning? Our secret is the patented Chem-Dry Carbonating Cleaner that uses the power of carbonation to apply millions of microscopic bubbles to your carpet that actually lifts stains away from your carpet and then, sweeps them away forever. Your carpets will instantly be at their freshest and cleanest state. The most effective commercial carpet cleaning is achieved by using a system that encompasses all 5 features of the W.A.T.C.H. acronym. Water. Agitation. Time. Chemical. Heat. Shampooing is chosen due to its rotary agitation and fast drying properties. Unfortunately, there is an insufficient amount of water to effectively clean and then rinse the loosened soil and cleaning chemicals from the carpet. This results in only average cleaning results and rapid re-soiling. This method is chosen for its fast drying properties. A crystallizing polymer is applied to the carpet and attaches itself to the soil. The polymer is allowed to dry and then vacuumed from the carpet, bringing with it the attached soil. While this process may be recommended for “in-between” cleanings; it doesn’t take the place of a deep cleaning using agitation and heat to loosen the soil, and water to rinse the soil from the carpet. In addition to these problems, it is also essential that the carpet be vacuumed frequently to avoid build up of the polymer. Chem-Dry’s signature cleaning solution, The Natural®, is a cleaning mixture that, through the power of carbonation, lifts dirt to the surface where it is whisked away. The Natural is non-toxic & ideal for homes with kids and pets, and recently received the Green Certification. “My Ohana Chem Dry experience was great! “Excellent professional service my floor looks brand new!! !